Kentucky assistant Vince Marrow finished among the nation's top-ranked recruiters for 2017. 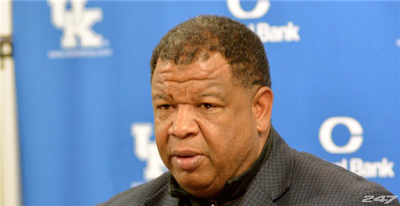 With Kentucky's class complete and the dust settled on National Signing Day, UK assistant Vince Marrow finds himself ranked among the nation's top recruiters during the 2017 cycle. With 10 total commitments in tow, the Wildcats tight ends coach and recruiting coordinator finishes 2017 ranked 33rd nationally in the 247Sports Composite Recruiter Rankings. Marrow, who served as the point man on five of Kentucky's six highest-rated prospects, including Lynn Bowden, JaVonte Richardson, Joshua Paschal, Tyrell Ajian and Danny Clark, accounted for all four of UK's 4-star signees. In his homestate of Ohio, Marrow signed six of the state's top 31 prospects, second only to Ohio State's seven. Over his first five recruiting cycles, Marrow has been responsible for over a third (41) of the 114 total commitments under Mark Stoops. including Benny Snell, Jordan Jones, Mike Edwards and C.J. Conrad. UK's next-highest rated recruiter was Eddie Gran, who was responsible for seven south Florida commitments, and came in at No. 115. Kentucky's 2017 class ranks 28th nationally according to the 247Sports Composite Team Rankings, the second-highest finish in the Stoops Era.